The bubble shooter specialist, now even more colorful! 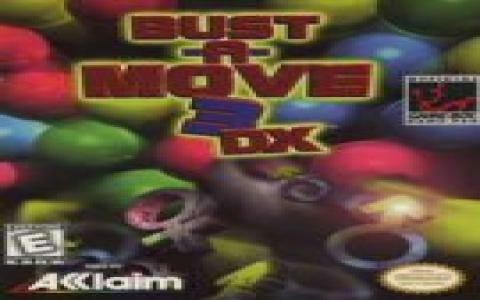 Bust-A-Move 3 DX is one of the later bubble shooter game in the series and for its age it shows a more colorful, more bubbly environment, with backgrounds stolen from all sites of the world, be them from Egypt, Britain, Morocco, etc. But, you'll probably pay less attention to these background images and more attention to your angle of shooting. That is basically the gimmick of the game: you have a stationary cannon that can be angled in a number of positions, shooting alternative color balls. You have to shoot in such a way as to cluster at least 3 same color bubbles together. Once you've managed that the cluster will evaporate and the advancing bubbles coming your way will be deflected from reaching you. It's like a reverse Tetris, in that the impenetrable wall accumulates upwards, and also, you only need 3 continuous bubbles to burst them out of existence. 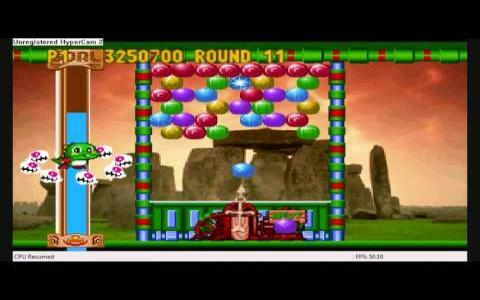 But, be a good sport and manage to take more out of their bubbly misery and your score will be multiplied. So, as you can see, it pays to think it through strategically. Though, just as with Tetris, holding on for too long may cause you to forever block your own way out and for the bubbles to overtake you. So play carefully!